Embroidery Is It Making A Comeback In The Runway - Trishtha Industries Pvt. Ltd.
Embroidery: is it making a comeback in the runway? Embroidery seemed like a thing of the past until recently it started making a comeback onto the fashion scene. For the Autumn/Winter seasons, the biggest trend was clothes, bags and shoes getting a colored threaded facelift. Embroidered clothes and accessories were seen adorned by models walking the ramp for the likes of Dolce & Gabana and Alexander McQueen. From the runways to the high-street fashion stores, it is a statement that you simply cannot miss. There is no denying that embroidery has been around for a really long time. However, like most trends, it has fallen in and out of favor with the vagaries of fashion. But, this fashion season, the famed designers thought of playing around with classic pieces, such as crisp white shirt, black leather jacket or jeans and add to them eclectic and quirky embroidered detailing. The designers are absolutely not subtle about it! If you follow fashion news, you will noticed that they have not used printed fabrics, but have gone all out with embroidered eye-catching florals. Even Cavalli has joined the bandwagon and seem to be in love with embroidery! So, were you waiting for some kind of sign to start your embroidery business? Probably, this is the sign that you have been waiting for! Embroidery is in hot demand amongst the fashionistas and from clothes to handbags, scarves, shoes to jackets, every fashion-loving person owns at least one embroidered piece in their wardrobe. 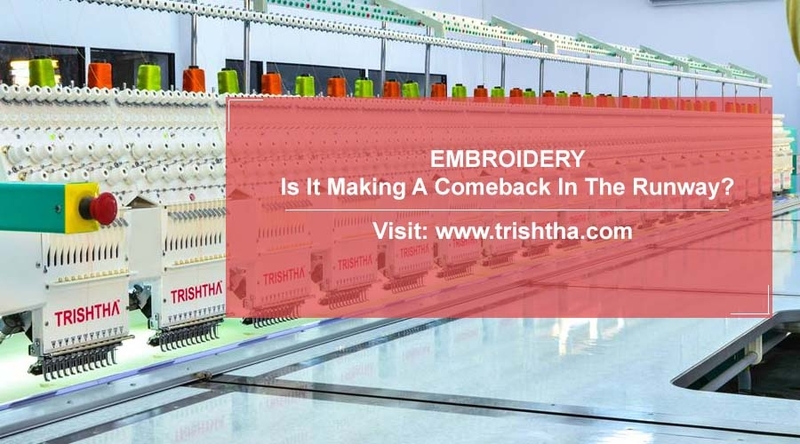 At Trishtha, we carry a range of computerized embroidery machines with multi-needle facility that can help you start your business. Initially, you can work out of your home because our machines do not require manual labor. Get in touch with us so that we can discuss the prospects of your embroidery business.